"Tastes just like a chocolate covered cherry!" Fill a cocktail shaker with ice, and pour in the amaretto, grenadine syrup, chocolate syrup, and heavy cream. Shake well, and strain into shot glasses. This is really tasty! 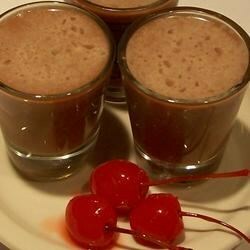 I put a maraschino cherry in each shot glass before serving. The recipe actually made 3 regular sized shot glasses full. These are awesome! Had them (along with some other drinks) for "cocktail time" with my sister in law and these were our favorite! Yum! I love the sweet drinks and this is a hit. I have to admit. I poured it all into a fancy glass and drank it as a cocktail. This would be great blended with some ice cream too. Absolute hit at our Christmas parties! made these for hubby's birthday party, and they were a hit all around! I personally didn't like it, but several people couldn't believe how much they tasted like the name!